This electric fuel pump has a tumble-polished billet look with a red logo and features an improved design for street and strip applications. It has a 97 GPH flow rate with 71 GPH at 4 PSI. It draws only 2 amps and has a maximum pressure of 7 PSI with an externally accessible pressure relief valve. It weighs 2.88-lbs, includes mounting brackets, and has a lower housing casting for enhanced fuel flow and quieter operation. It is not designed or recommended for use with fuel injection systems and is not compatible with alcohol or methanol fuels. A regulator is not required. 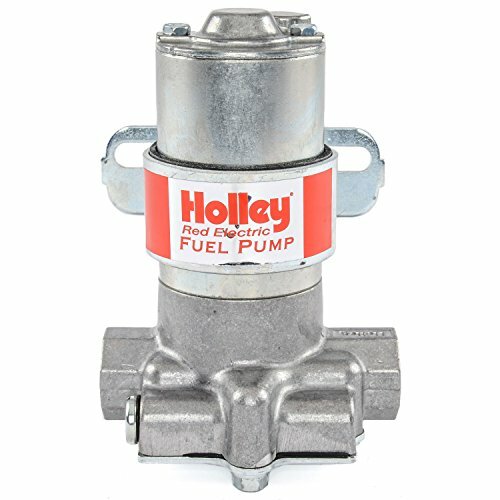 If you have any questions about this product by Holley, contact us by completing and submitting the form below. If you are looking for a specif part number, please include it with your message.